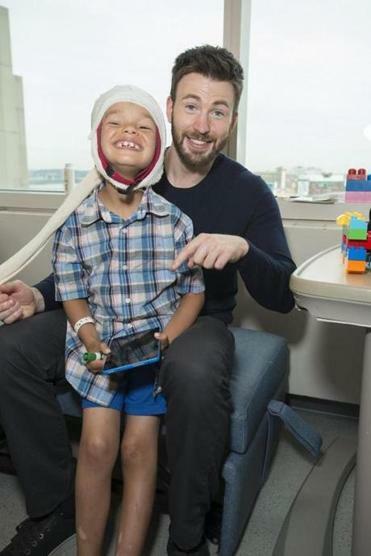 Chris Evans and 7-year-old Jude Langstaff at MassGeneral Hospital for Children. 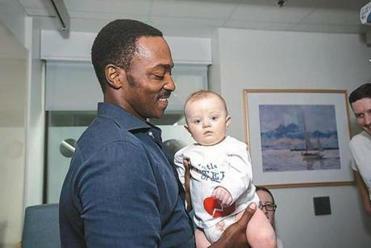 Anthony Mackie and 9-month-old Carson Stenson at MassGeneral Hospital for Children. “Captain America” stars Chris Evans and Anthony Mackie surprised dozens of young patients at MassGeneral Hospital for Children when they dropped by for a visit on Tuesday morning. The actors greeted children on both pediatric inpatient floors, as well as the pediatric intensive care unit, and spent about two hours chatting with the them, posing for photos, and signing autographs. “The kids were absolutely thrilled,” said MGH spokeswoman McKenzie Ridings. Evans and Mackie were accompanied by Hallie Lorber, president of the David Ortiz Children’s Fund. We’re told that Mackie — whose son was born with a congenital heart defect — is an enthusiastic supporter of Ortiz’s fund, which helps fund heart surgeries for children in New England and the Dominican Republic through partnerships with MassGeneral Hospital for Children and the World Pediatric Project.